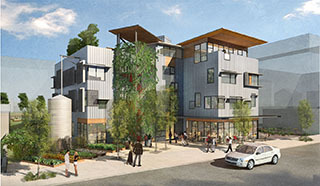 Greenfire in Ballard is a mix of sensible sustainability and social sustainability. Two ideas guide the design of Greenfire Campus: sensible sustainability and social sustainability. The project represents an important milestone in sustainable design by forwarding the value of energy-efficient strategies and construction built to last. In 2011, the Wilberforce Foundation began its search for a new home. The foundation is focused on environmental conservation, and designing a new office space had to meet two primary goals: allow the presence of the natural environment to play a part in the design of the building, as a reflection of the foundation’s mission; and demonstrate that green design can be accomplished in a cost-effective manner. A third goal was to seek an urban, in-fill location in a transit-orientated neighborhood. One site east of the Ballard public library kept rising to the top of the search list. The two buildings that make up Greenfire occupy less than half of the site. The site had a lot going for it. It was in the center of a growing community, close to transit, public amenities and a vibrant retail district. The barren parking lot was too large for our project, but the neighborhood was perfect. We began to explore the idea of building more than a small office building. The team developed a “campus” concept that includes residential and retail uses as well as office space. Today, Greenfire Campus sits on that .85-acre lot in the urban center of Ballard. It includes a five-story apartment building with 18 units, a four-story, 18,000-square-foot office building with two restaurants on the ground floor and 38 parking spaces. The two buildings are orientated to take up less than half of the site’s footprint and to maximize solar access, views and interest. This diagonal orientation is one of the first distinctions that a passerby often notices. Promoting a natural context within the urban environment meant designing a campus that harmoniously shares space with wildlife and humans. This context provides a wide range of human interaction with nature, including environments where natural conditions prevail, promoting habitat for flora and fauna and at the other extreme, where human activities dominate  streets, sidewalks and plazas designed as part of the urban experience and as generators of social sustainability. To assist in our decision making, we applied two concepts: social sustainability and sensible sustainability. Social sustainability is the idea that one can live, work, play and grow food in the same vicinity. The Ballard site had this potential. 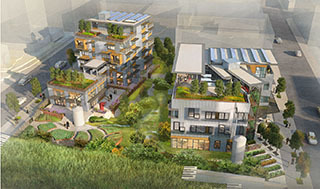 It was large enough to accept commercial and residential buildings and dedicate 50 percent of the site to urban agriculture, wildlife habitat and outdoor plazas that promote interaction between residents, neighbors and workers while letting nature have its way in the heart of Ballard. To create the right context, we began by combining conservation with ecological practices. We explored the relationship between building uses, building locations and even the shapes of the buildings in how they relate to the natural environment. We then applied conservation measures and how people live and can best conserve the land and our natural resources. Creating diversity of use and outlook is a means of promoting social sustainability. Our built environment consumes 40 percent of the energy used in the United States, yet we do very little to reign in this usage or to limit our impact on the environment. We see buildings that explore the boundaries of sustainability and we see many that meet only minimum code standards. The exploratory projects frequently invest in cutting-edge green without great concern for the proforma while minimalist projects seek the standard seven-year profitability. Greenfire Campus seeks to explore the middle ground, testing the idea of sustainability in the context of a long-term hold and with construction costs that are not prohibitive. It is designed around achievable strategies that make sense in the context of a 20-year proforma. Building costs will be recouped over time, and as energy costs continue to rise, profitability will extend beyond a typical building lifespan. This is the basis of sensible sustainability. Office and retail, including a new Skillet restaurant, face Northwest 56th Street. What strategies have we applied in pursuit of sensible sustainability? • Ecology-based land use. Fifty percent of the land is set aside for open space and the buildings are located based on solar access in order to create micro-climates for urban farming and P-patches. This includes green roofs with edible berries and plants for wildlife and human consumption. • Bioclimatic design. Ventilation is natural to the greatest degree possible and depends on user management rather than high-tech systems. Window location, forms and patterns are all designed to maximize access to the sun and light during winter months and are fully operable, allowing for natural ventilation during the summer months. • Energy independence. The mix of uses (office, residential, retail) provides variable energy demands so that heat and energy can be stored and transferred between uses. This is made possible through photovoltaic, geothermal and solar hot water systems that generate energy on site and minimize the carbon footprint by relying on shared energy sources. • Water balance. What was once an acre of asphalt is now unearthed as a biofiltration garden fed by rainwater that is collected in cisterns. The project will also manage water in a way that minimizes the impact on city infrastructure. Interiors are an important aspect of any building and great attention was given to incorporating the “sensible and sustainable” philosophy indoors. Decisions were filtered through the concept of natural expression creating diversity of form and pattern. There are large open spaces, indoor landscaping with edible plants, ecologically themed elevators with audio that represents sounds in a rain forest from the ground to the top of the tree canopy and visa-versa. Working with Robin Chell of Chell Design, the spaces feature many sustainably sourced materials, including locally made recycled glass countertops, recyclable carpet tile that is Greenguard-certified with minimal off gassing, all VOC-free paint, locally made furniture from reclaimed wood, outdoor furniture made from recycled plastic bottles and much more. The commercial building is scheduled to achieve LEED platinum certification while the residential building will achieve LEED gold. But this project looks beyond LEED certification and seeks to demonstrate strategies that will and can be adopted by other developers in search of smart growth. Although the building certifications and technical applications at Greenfire are impressive, the most exciting part of the project is its potential to promote human interaction and create a sustainable core within the Ballard community. It extends the greenbelts of the neighborhood by allowing nature to hold sway between and around the buildings. As an example of social and sensible sustainability, Greenfire will contribute to the growing impact of our region on a smart approach to the built environment. Seattle-based Johnston Architects specializes in architecture that blends the inside and outside with innovative thinking and sustainable design.